I really enjoyed this documentary on the construction of Gaudi’s Sagrada Familia in Barcelona. Solid background material is interspersed with meditative shots of the construction in action, and on site interviews with figures major and minor tie it all together. This is a building that has been the center of controversy since it’s inception, and an even-handed and illuminating picture is drawn of the various conflicts and issues. For example, interviews with two of the main contemporary sculptors, Josep Subirachs and Etsuro Sotoo, illuminate the central issue of the building: how to finish it? Gaudi’s designs and models, though ruined or destroyed by Anarchists in the 1930’s, give a complete enough view of the big picture. The problem lies with sculptural details and finishing – key to Gaudi’s work. These were left to the future, and deliberately so, as Gaudi himself anticipated centuries of construction after him. So whose vision rules, Gaudi’s, or his successors? It’s a debate that can’t be settled for all time, but to me the building is so strongly stamped by it’s author that everything else must to some degree give way to it. But a balance can be struck, and though I’m not wild about Subirach’s Passion Facade, I think he got it right. The feeling is congruent with the theme, though the style is modernist. 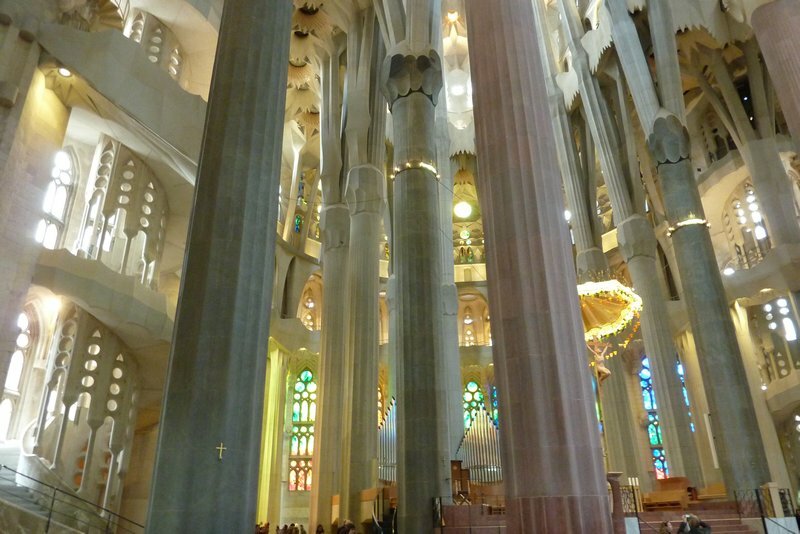 And it’s tucked under Gaudi’s bonelike pillars so there’s no question who’s boss. Also interesting: the Sagrada has architects and designers on site, working directly with the builders to find the best way, rather than have designs issued forth from an architect on high. And the touching Catalan pride the workers take in the project is inspiring. I watched Sagrada: The Mystery of Creation on Netflix streaming. This entry was posted in Architecture, Art and tagged Gaudi, Sagrada Familia. Bookmark the permalink. I first meandered around this site when I was in college, when you could ramble all over it if you put a few pesetas in the jar. It seemed like a 1000 year project then. a decade later it was mostly boarded up, so seeing the site as a hub of activity cheers me greatly.. I think that it will stand as a great Catalan monument someday.